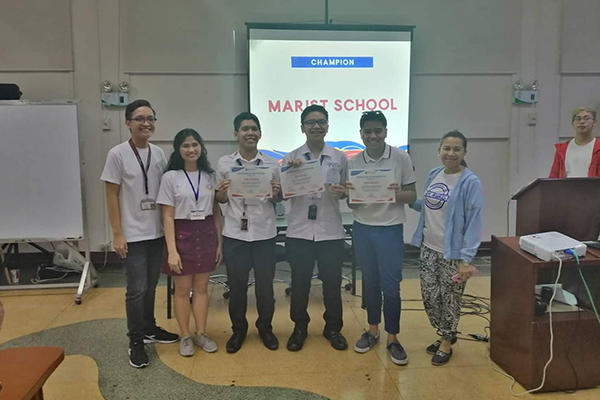 Junior high schools students from Marist School bagged recognition after winning several categories in the recently held Ped Xing X: Capturing the Philippine Democracy at the University of the Philippines last January 19-20, 2019. Gavino was named as the Best Debate Speaker. Meanwhile, David Cabrera placed third in the extemporaneous speech contest against 16 other schools. Other Marist representatives include Joshua Cuejilo for poster making; Sebastian Bermas for English essay writing; Laurence Alfonso for Filipino essay writing; and, Malcolm Dela Cruz, Jan Estioco, and Sebastian Bermas for quiz bee. Accompanying the students in the two-day event was Marist Debate Society moderator Mrs. Mary Villanueva. Ped Xing is an annual politics camp headed by the UP Political Science Society.